Sarkar 3 fails on many levels. The film is crammed to the gills with characters and motives that go nowhere. Amitabh Bachchan is earnest but even he cannot prevent the poorly scripted and horribly hammed work from turning into a train wreck. Can Ram Gopal Varma be reset to factory settings? Despite Amitabh Bachchan trying his best, where’s the novelty? Of a bland Cheeku, comic Bhiku and more.. Although a maverick filmmaker, RGV has had several hits and misses in his career. The (hopefully) last film of the Sarkar trilogy, unfortunately, is one of the misses. Ram Gopal Varma has little new to offer in the third part of the ‘Sarkar’ films, but the veteran actor is in fine form. 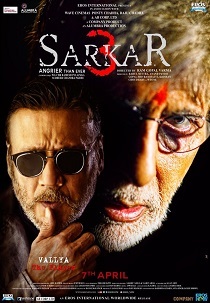 Sarkar 3, the third film in the Sarkar (2005) franchise, opens with a typical Ram Gopal Varma punch line, giving us hopes of him returning to his comfort zone and top form. Amitabh Bachchan-Ram Gopal Varma’s sloppy revenge drama is saved by a surprise twist! Sarkar 3' is like a squeaky roar due to bad screenplay and lethargic direction. The movie had all the potential to become big just like a mighty roar of a lion.